Vegan Momma Monthly: Enter for a Chance to Win! Welcome to Vegan Momma Monthly! Our newsletter subscribers range from the newly pregnant and/or newly vegan to the new moms trying to convert their families to a plant-based diet. 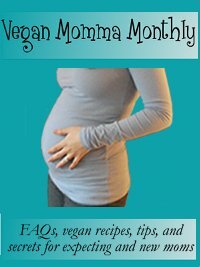 Rather than give you a month-by-month guide to pregnancy like you can find in so many places, you will find general suggestions for a happy, healthy vegan pregnancy to the first few years as a new vegan momma. Our goal is to provide encouragement to keep you confident and secure in your role, and support you with a community of like-minded individuals. I hope you enjoy this newsletter! *Question: "What milk should children drink after breastfeeding?" *What's New? : What's New With Vegan Momma? Vegan Momma is a rapidly growing community of moms (and dads) who are dedicated to providing their children with the healthiest possible food options, as well as compassion for all living beings. If you know people who follow this philosophy, we'd love you to spread the word, whether they're vegan or not. The only way we can make a true difference in the world is by continuing to promote the positive benefits of a vegan lifestyle. If a friend forwarded this to you and you want more, visit Vegan Momma to subscribe for free and we'll see you next month! We just got our facebook page up and running and we're on a mission to build that community so that more moms will have a place to go for positive information on the vegan diet. Please take a minute to like us at facebook and share with your friends. This month you have a chance to win a free copy of The Vegan Pregnancy Survival Guide by Sayward Rebhal! I reviewed her book and think it would be an awesome addition to any pregnant woman's stack of reading material, and it's especially amazing for the pregnant vegans out there. Read my full review of Vegan Pregnancy Survival Guide and then enter to win for yourself or to give as a gift. Entering is easy... all you have to do is share the story of your pregnancy with us. New moms always look to those with experience for guidance, and in the vegan world we need more amazing, positive examples of the joys of vegan pregnancy. Even if you weren't totally vegan the entire time, please share! Sharing your story not only gives you a chance to win a free book, it also helps the women coming to Vegan Momma with questions and worries. Please take this chance to help others. I read recently that what a child eats in the first 1000 days of his life, from conception to age 2, has the greatest impact on his future health. Not only does this prove that pregnancy isn't a free license to go nuts on vegan junk food, but it also shows that persistence when introducing fruits and vegetables to your toddler pays off. You just have to work hard on it at the beginning to create that foundation. As important as knowing what to eat is also knowing what not to eat, both during pregnancy and beyond. If you eat well when your baby is cooking and avoid the most harmful foods, you give your child the best advantages for their future. One of the steps at the first prenatal visit tends to be instructions on what to eat, how to exercise, and what foods to avoid during pregnancy. Find out how a healthy vegan diet stacks up against the typical list of what NOT to eat during pregnancy. Question: "What milk should children drink after breastfeeding?" My daughter is 9 months old now. I plan to nurse her for at least a year but probably a little longer as she is pretty much obsessed with my breasts :-) . What type(s) of milk is/are best for her? I know that she can get her calcium from other sources. However, non-vegans say that she needs the cow's milk to get the fat. What else can substitute for this? This is an interesting and somewhat contentious topic. Humans are the only animals that continue to drink milk after being weaned, and also the only animals that drink milk from another animal. Our bodies are designed not to need milk after we stop drinking our mother's, and in fact, most people develop a lactose intolerance shortly after being weaned. So, what should milk should we feed our children? Read my entire response about what milk children should drink after breastfeeding. Do you have questions about vegan pregnancy and raising vegan children? Join in the discussion on our site by asking and answering questions, as well as commenting on other answers. You can pay it forward by sharing your experiences with expecting and new moms. Tempeh is an excellent source of protein, and it's easy to manipulate the flavor and texture to resemble meatier recipes of your past. Also, because it's made with fermented soybeans, you get more of the soy benefits without having to worry about the soy controversy over estrogen and whatnot. I've tried a wide array of different tempeh recipes in my day, but I tend to have just a few that I use often. I love this BBQ 'Ribz' recipe for Southern food nights and as a summertime staple, and my husband loves it for football parties. And, this scrambled tempeh is a yummy, protein-packed addition to any breakfast, brunch, breakfast-for-dinner, or even just piled atop a salad. Check out my favorite tempeh recipes, scrambled tempeh and BBQ tempeh "ribz" here. If you have a tempeh recipe you're proud of and would love to share with everyone, you can do it at the bottom of the page. Vegan Momma is a natural extension of Vegan Nutritionista, which is a broad site on the topic of vegan nutrition, vegan recipes, animal rights, and general tips on the vegan lifestyle. We have lots of different downloadable vegan ebooks to help guide you on your new vegan diet. FREE 11-page guide to vegan pregnancies, babies, & children!